League tables showing hospital rates of a form of the superbug MRSA have been published. The figures were published as the National Audit Office attacked the NHS for failing to provide a full picture of the impact of hospital infections. The government tables show some of the highest rates were in the country's most prestigious specialist hospitals. The league tables are split into general and specialist hospitals and class trusts on the number of cases of MRSA bloodstream infections per 1,000 overnight stays by patients in the hospital. The Department of Health said that there were difficulties in comparing rates with different trusts because of factors such as the types of patients treated at different hospitals. While some hospitals made headway in reducing MRSA infections, rates in others had increased since the last set of figures were published by the Department of Health and the Health Protection Agency in December. Guy's & St Thomas's NHS Trust in London, a specialist hospital, had the highest MRSA rate at 0.45 cases per 1,000 overnight stays. Other specialists hospitals with high rates included Hammersmith Hospitals NHS Trust in London, University Hospital Birmingham and King's College Hospital in London. In the table of general hospitals, the North Middlesex Hospital NHS Trust had the highest rates with 0.33 cases per 1,000 overnight stays. This was worse than its performance from the previous year when the rate was 0.30 cases per 1,000 overnight stays. Some hospitals improved on last year's figures, like Weston Area Health NHS Trust in Weston-super-Mare. 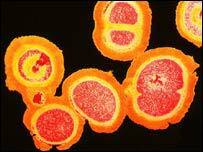 But some of the hospitals with the lowest rates last year had a rise in MRSA cases this year. York Health Services NHS Trust slipped 42 places in the ranking from having the lowest rate of MRSA cases for a general hospital last year. This year's general hospital with the lowest rates was Hereford Hospitals NHS Trust. Health Secretary John Reid said: "Today's publication of the latest MRSA rates, hospital by hospital, on the internet is an important part of giving patients more information about this problem. "It is clear from these figures, and from today's National Audit Office report, that some parts of the NHS have to do more to control this threat and match the achievements of hospitals which maintain low MRSA rates. "The NAO report is an important reminder that everyone in the NHS needs to keep infection control at the top of their agenda." Prof Pat Troop, HPA chief executive, said: "The increase we have seen in these infections over the last decade is caused by a combination of reasons including the fact that through the advances in modern medicine we are now able to keep patients alive for longer. "But this means carrying out more invasive procedures which can lead to infection and also through the emergence of epidemic strains of MRSA which can be more difficult to control." Data for each hospital trust is available on the Department of Health's website.